Wow that's some title! LOL. But I wanted to put it all out there upfront. 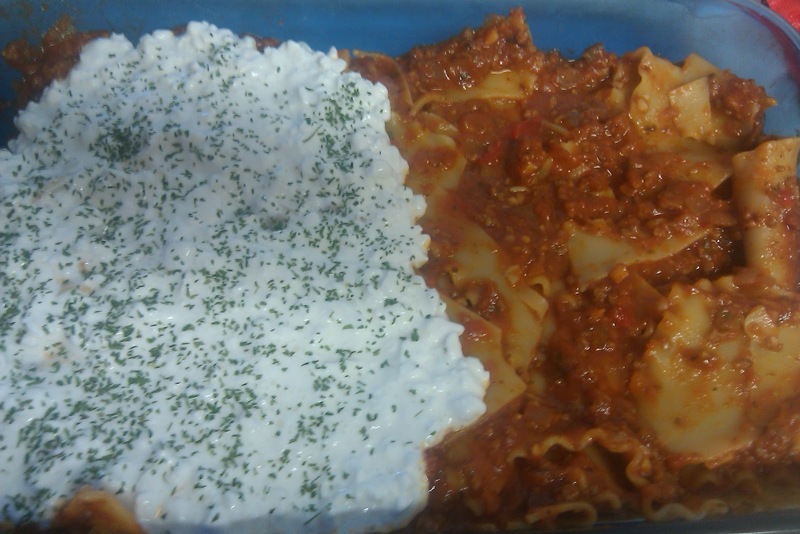 I love lasagna, I mean who doesn't right? But it takes so much time to make it that I hardly ever do it. But then I saw good ole Rach.el R.ay do this trick and it changed my lasagna eating life. All the yum with half the work. 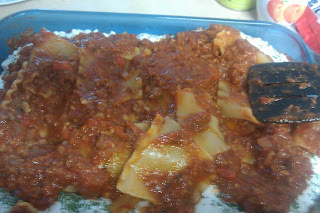 If you do it quick and dirty, with just browned meat and canned sauce... you could easily pull it all together in about a half hour for a quick weekday dinner. 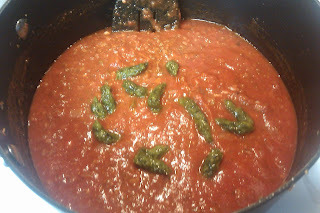 But if you take the time to make a nicer sauce, like mine below, it will take a bit longer and taste a lot better. 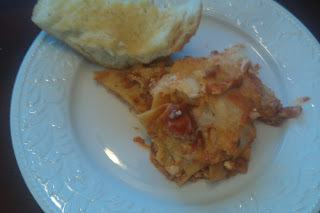 Still, from start to finish, I had dinner on the table in under an hour. 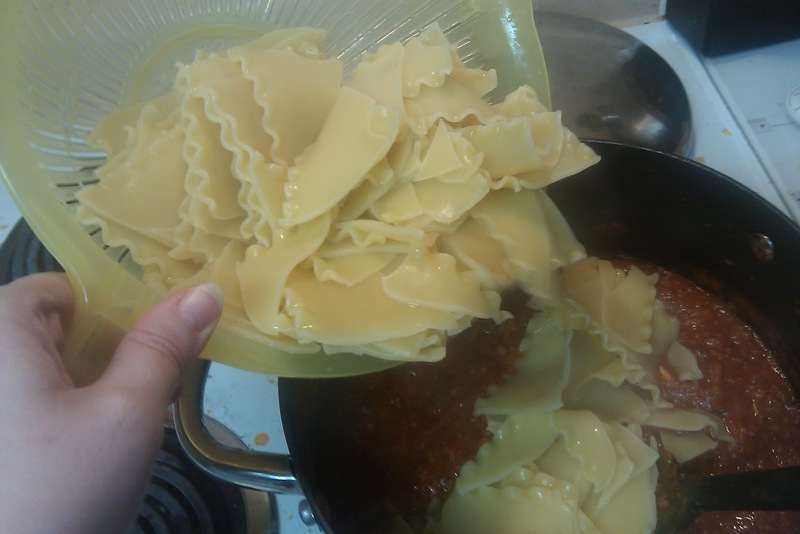 Basically, you take the lasagna noodles and break them up into pieces before you boil them. I try to break each piece about 4 times. You'll get all different shapes and sizes, and that's great! So you boil them according to the instructions on the package, plus 1 minute. Then drain, and add to your meat sauce. Then stir to coat them all and get it evenly distributed. Put half of it in a cake pan (9x13) and then top it with some cottage cheese (or ricotta if you're fancy) and a sprinkle of dry parsley. Then put the rest of the noodles on top of the cottage cheese. Top that off with the bechamel sauce (or grated cheese if you prefer), and a sprinkle of grated parmesan, and stick in your oven on 350 for about 25 minutes. Let it rest for 5 minutes before you serve it. The only drawback is that I can't get a "clean slice" to make a nice picture. It's "messy" lasagna, remember? Now if you want my own recipe, which you totally should because it's awesome, here it is. 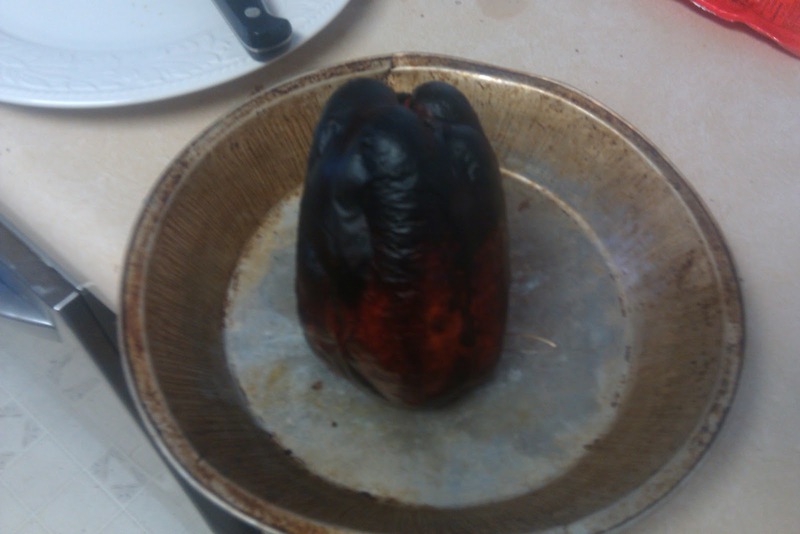 So first, you need to take a red bell pepper and get it roasting in the oven. Put it in a pie tin about 6 inches below the top heating element and set your oven to "high broil." Keep it in there until most of the skin has turned black, about 10-15 minutes. Cover it with foil, or a bowl of some type to let it steam as it cools. When it's cool enough, remove all the skin, stem, and seeds... throw those away. Finely dice the meat of the pepper and reserve it. Now it's time to make your meat sauce. 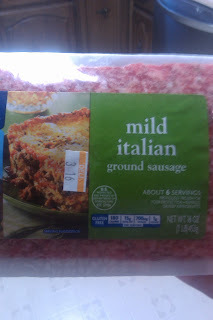 I believe in using ground sausage instead of ground beef. Trust me, it's so much better. You brown that up with some finely chopped veggies... I mean finely chopped. 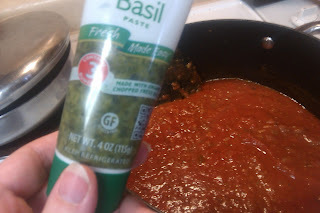 You want the taste in your sauce, but you don't want to have visible pieces of veggie. One onion, one carrot (I grate that), one stalk of celery. Put all of that in with the raw sausage and cook it until the sausage is brown and crumbly. 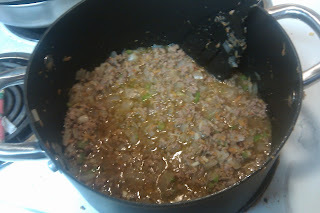 Add 3 or 4 cloves of minced/pressed fresh garlic. Let that cook for about a minute, then add one 14oz can of beef broth (or chicken broth if you prefer), as well as the reserved diced bell pepper. Cook it at a boil, stirring often, until pretty much all of the broth disappears, about 10 minutes. Once the broth has reduced down to nothing, add 48 ounces of canned spaghetti sauce,1 TBS of vinegar, 2 TBS of dried oregano, and some fresh basil. I've stopped using fresh basil during the winter, and I get this stuff instead because it lasts longer in my fridge. Then stir and let it simmer while you make the noodles and bechamel. So break up, boil, and add the noodles how I described above. 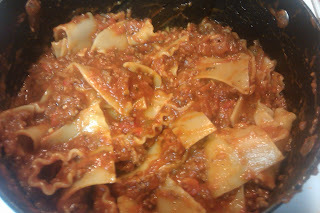 Then remove the noodle/meat sauce mixture from heat and set it aside while you make the bechamel sauce. 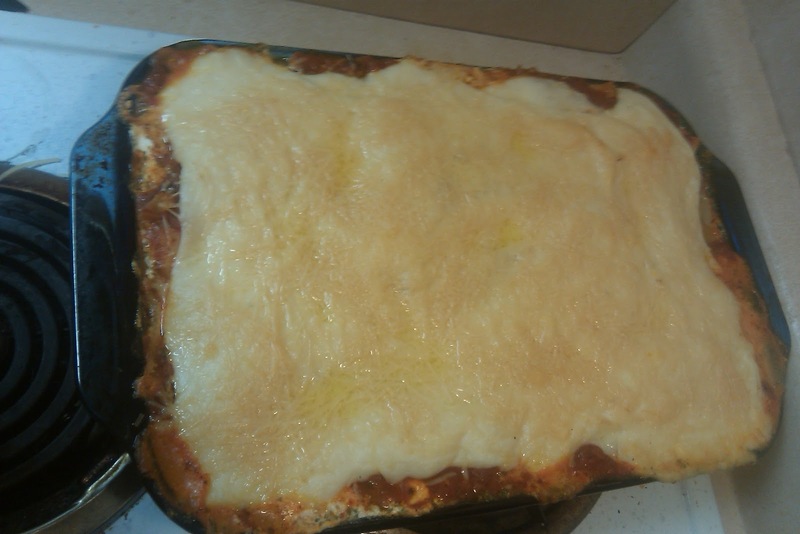 I used to make lasagna and top it with GIANT amounts of shredded cheese. Expensive and yummy. Then I decided to try bechamel sauce. It's a creamy cheesy yummy goodness sauce. I actually like it better than topping it with cheese, plus it's cheaper, more authentic, and is just rich and thick and gooey... mmmmm. Melt one stick of butter and then add 1/3 cup of flour. 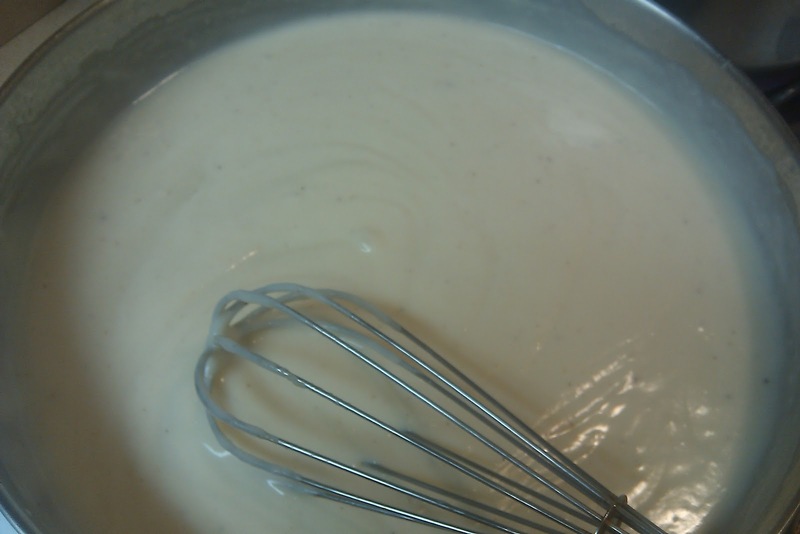 Whisk together to make a roux, let it cook for about a minute, maybe two. Then slowly add 2 cups of whole milk, whisking the whole time. Also add 1/2 tsp salt and 1/4 tsp nutmeg. Yes, that's right, I said nutmeg. Trust me, it's good and doesn't end up tasting like nutmeg, it just gives it a background zing. 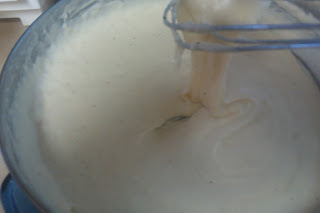 Keep whisking (or else you'll get lumps) until it gets nice and thick, like really thick and creamy gravy. Can you see the "streaks" that the whisk left in it? Remove from heat and whisk in 3/4 cup of shredded parmesan cheese until it incorporates (melts into) the sauce. It will get nice and cheesy, almost stringy. That's when you want to pour it over everything, and sprinkle another 3/4 cup grated parmesan on the very top for color and texture... and gluttony.